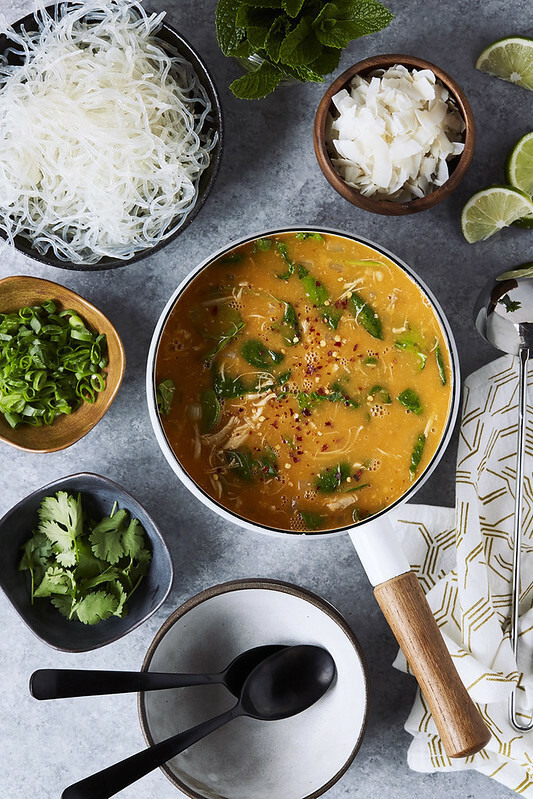 This Super Quick Coconut Red Curry Soup is ready in just about 15 minutes and it’s highly adaptable. Add chicken or shrimp, drop in whatever veggies are in season and you have on hand, add noodles, or don’t. It’s creamy, rich and a breeze to make. In continuing with the simple weeknight meal ideas, I bring you one of my go-to, super quick meals. I make and share this often on my Instagram stories and I am constantly receiving messages for the recipe. It hardly seems like a recipe to me, given what a breeze it is and how I rarely even measure, but here we go. 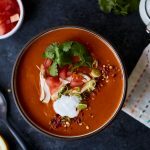 I often throw this soup together when I have nothing planned and I’m craving, comforting yet quick. For my house these are ingredients I always have in stock. We always have cooked chicken on hand, rotisserie or leftover shredded chicken thighs, that I batch cook at the start of the week. You can also add shrimp, as they cook up in the hot broth within just a minute or two. 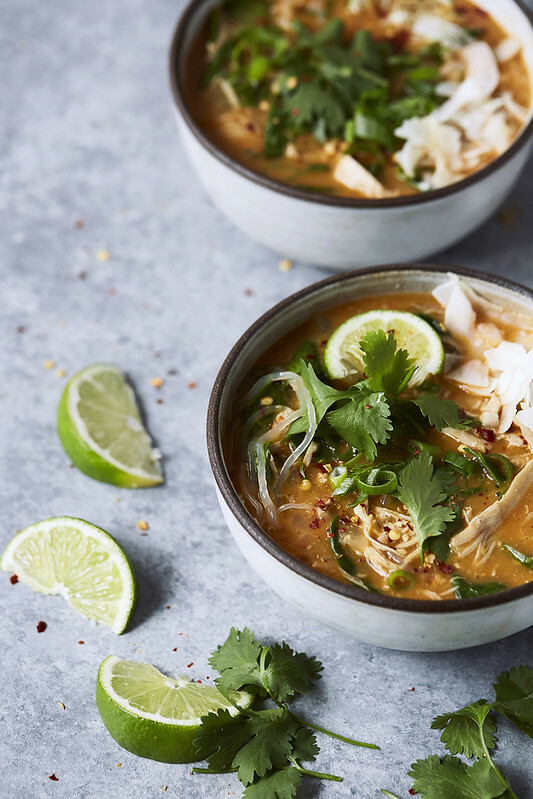 If you’re adding uncooked chicken, just cut it into small pieces and give your soup another few minutes. 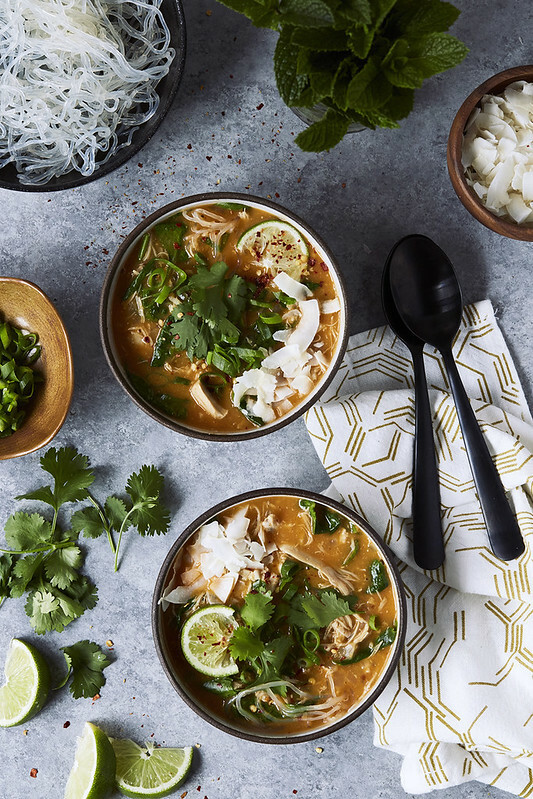 Since I’ve been eating low carb, I generally prefer to add kelp noodles to my red curry soup, but zucchini noodles are also a great option. Thing rice noodles or bean threads are also wonderful options, if you can tolerate them. 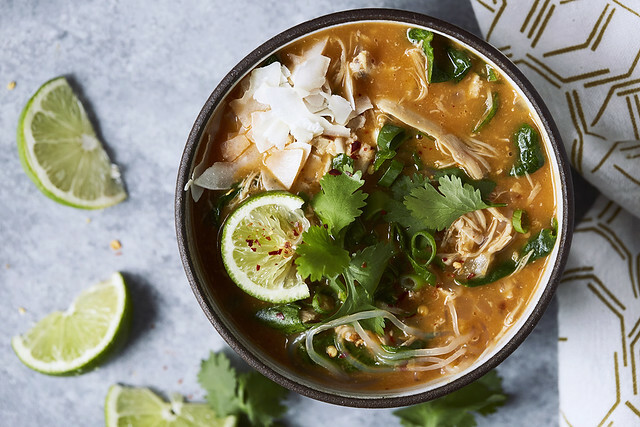 Veggies are a must in this soup. I prefer baby spinach, but kale, chard or other greens would work. I really love adding peas and/or green beans, too. Cut up zucchini would be also nice. Cauliflower and broccoli are more hearty, but make a wonderful addition. If you have them around, red, orange or yellow bell peppers are a nice add-on in color, flavor and crunch, add those at the beginning, with the onion. Try adding chopped or diced tomatoes at the end, too. What’s most wonderful about this soup is the multi-layered complexity of flavors, given how little work is required. 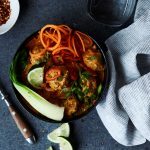 There is the creamy, rich coconut milk, the slight heat from the curry paste, the lime juice brings a fresh, bright tanginess and for those that add the fish sauce, you get a beautiful, savory, umami funk (funk in the best way possible, obviously). In a medium to large pot over medium heat, add the coconut oil. Add the onion and saute for 3-5 minutes until translucent and tender. Add the garlic, ginger and red curry paste. Cook an additional 3-5 minutes, until fragrant, Stirring very often. Add the broth and fish sauce, if using, whisk well to combine. 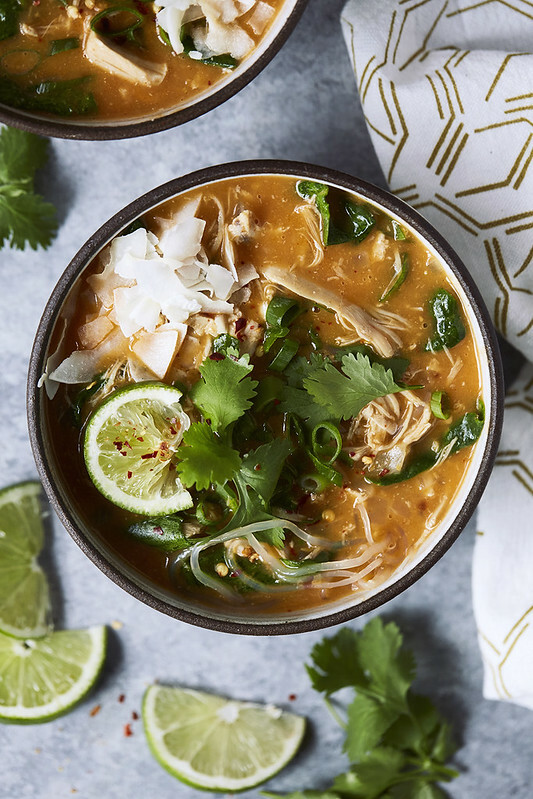 Bring to a gentle simmer and add the cooked chicken and coconut milk. Simmer until the chicken is heated through. Add the baby spinach and stir to combine and wilt. Finish with the fresh lime juice, and include some lime zest, if you prefer. Serve immediately over kelp, rice or zucchini noodles. if using uncooked chicken, simmer the soup for longer, until it is opaque and cooked through. This was my first attempted recipe from tasty-yummies and it BLEW MY MIND…. so easy, so quick, and so delicious. I added beet zoodles to the actual soup because I was too lazy to cook them separately. It turned the soup a beautiful red/orange color and added a little earthiness to the flavor. The amount of curry was perfect, just the right amount of spice. I also added sweet potatoes, garbanzo beans instead of chicken, and some asparagus. You could literally add anything to this and it’s amazing. Keeping this is a go-to for sure! Thank you! This might be the ultimate post for me! Today, a snowy day in VA and I have prepared this soup for dinner. 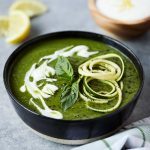 Keeping-in-line with your writing, I have transformed this soup, to a spectacular – dazzling arrangement of dandelions and freshly spiralized root veggies! You, are my hero, day-in-and-day out. ~ Feeling loved by your generosity!…. YAYYY this makes me so so happy. Thanks Katie. 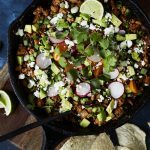 This made the meal prep roundup this week and it is BOMB. I love that it is a large enough recipe to leave half in the fridge to last a few lunches and throw the rest in the freezer for when I’m in a pinch and don’t want to cook. 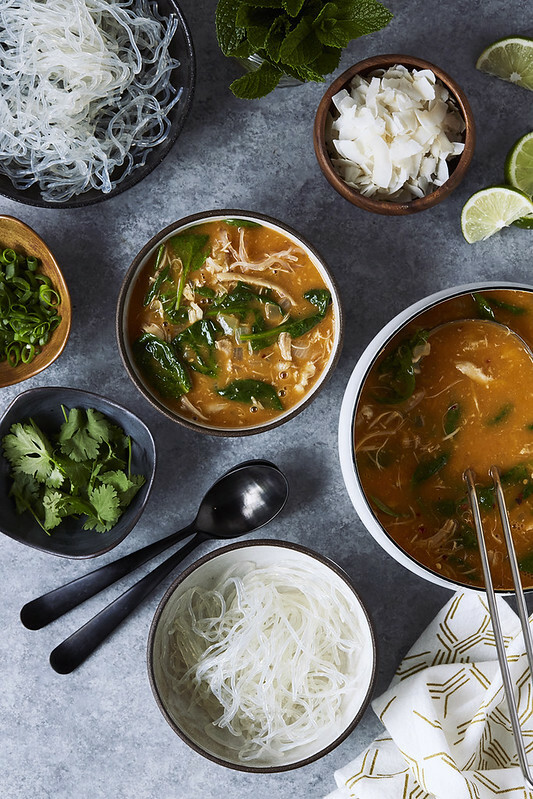 Keep the Thai-inspired recipes coming! YAY!! SO glad you liked it and that you made a few meals out of it. Thanks for the comment. I love Thai food and this did not disappoint! I made it with cauliflower, spinach, and shrimp—so good!